Three years ago, we in the Heartland Ayllu – the local Kansas City community of the Pachakuti Mesa Tradition – decided to start our own tradition. It is common practice within an ayllu to hold community Link Up ceremonies on Wednesday nights, often once a month. 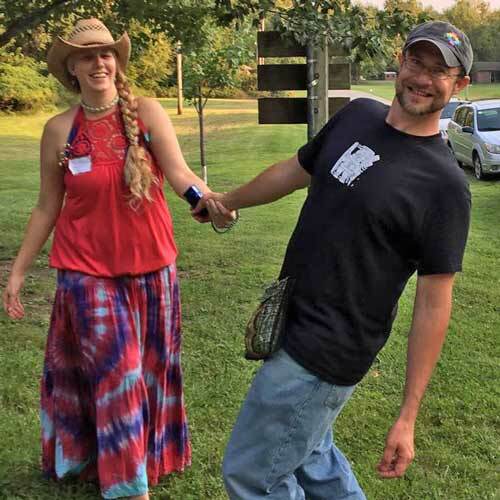 Those gatherings are wonderful; however, the community was yearning for something deeper to connect us other than the PMT Apprenticeship series and one evening a month. So, we came up with an idea: let’s create an annual day-long event of connection and ceremony. Thus, we created the Heartland Ayllu Festival! The Festival is truly a wonderful heart-felt experience. Along with an opening and closing ritual, the day is organized in a series of ceremonies honoring the five elements of the Pachakuti Mesa: allpa (earth), unu (water), wayra (air/wind), nina (fire), and t’eqse kallpa (aether). There’s usually tons of music, fun, and dancing to be had. Even though it is a ceremonial day, we call it a Festival because it is truly a celebration of life, of Nature, and of our community. Every year we have a theme, and this year we called the Festival “The Gathering of the Mesas.” Held on Saturday, September 2nd, all mesa carriers were invited to bring their own mesa to be incorporated into a collective altar. 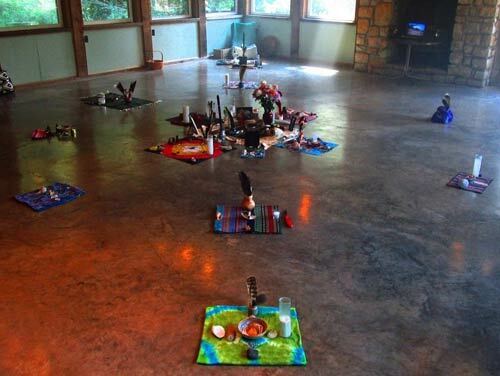 Our location was in the deep woods of Hollis Renewal Center in Kansas City, KS, and their Lodge was the perfect setup for the mesas to gather in a quiet space for people to come and pray throughout the day. The Lodge foyer also held a marvelous shaman’s market of vendors coordinated by Heartland Ayllu volunteer Calleen DeWinter. The day started high during the opening ceremony around the mesas. Without letting up, each ceremony transported us higher and higher. 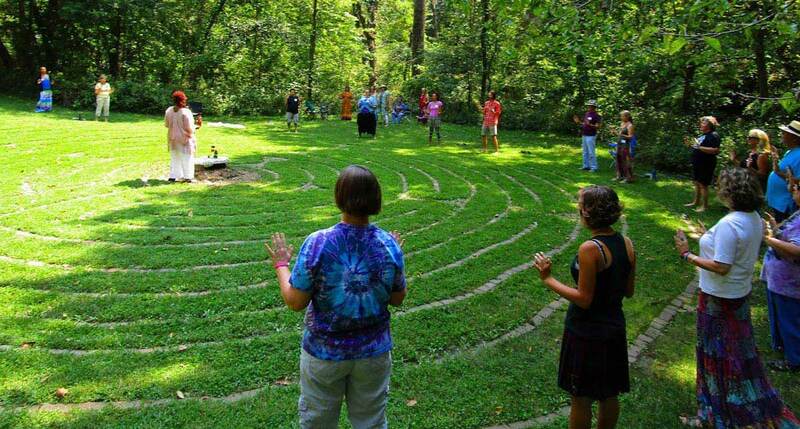 We performed the Pachamama Renewal Process in the Hollis Labyrinth led by Yeshe-La Chodron, which connected us deeply to the land at Hollis. We then took part in a Cherokee Water Blessing at the creek side, facilitated by Susan Sykes, where we all felt connected to the truest essence of water as the very life within us. After that, Amy Cheung channeled our collective healing with sacred feathers during the wayra ceremony, accompanied by Autumn Paige Moler (my lovely wife) on the Peruvian flute. The wind and sonic resonance of the flute harmonized with one another in an uplifting crescendo of connection with Spirit. After that, Stephanie Red Feather led the nina ceremony, guiding us through a journey to get in touch with the fire within, inspiring us to tune in to that Divine spark and ignite our passion into the world. By then the Sun was setting and we had reached our 7th-inning stretch, which was filled with an incredible performance by Ayllu. A local Kansas City band, Ayllu is a group that performs a mix of traditional Latin American music and modern vibes. The music reinvigorated us as we danced and laughed until our sides hurt. The day ended with a despacho ceremony gracefully facilitated by PMT Sanctioned Teacher (and my lovely wife) Autumn Paige Moler. The pago was given to the fire with a lively and uplifting drum round from the Great Owl Drum group led by Lyn Fifield. This was the apex of the event as the energy had built strongly, yet sweetly, throughout the day to culminate in a celebratory dance around the communal fire. 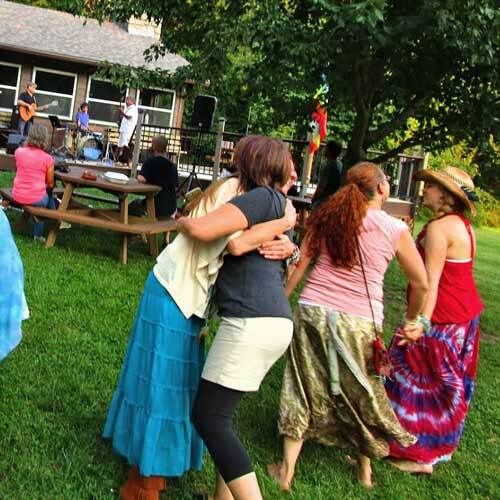 The force of our communal prayer and celebration could be felt, physically even, as a blanket of pure medicine vibrating throughout the grounds. In addition to the day’s Earth-honoring events and fun, we managed to raise funds for Hurricane Harvey victims in Texas, as well as an orphanage in the Sacred Valley of Peru called Niños del Sol (Children of the Sun). As we closed ceremony for the night, everyone – tired yet joyous – pitched in to help clean up the grounds and pack up. 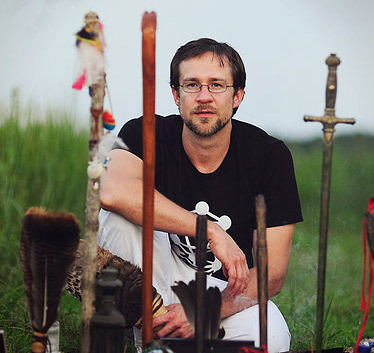 It struck me as I drove home that night with my family, still amped up from the day’s unique rituals of grace: it truly takes a community to make this Festival work. Indeed, community is an integral aspect to our lives as mesa carriers. There are so many people, beyond those named, who stepped up to assist with parking, the sacred fire, helping the band set up, or collecting donations…I couldn’t possibly list them all. The band Ayllu reiterated at the end of their performance that the word “ayllu” means “family,” and that is what we all are. We make things happen when we gather – good things. It is our hope that the collective medicine we created together will spill out into the world at large, so that one day the entire world itself can be known as one ayllu.